NextObey them that have the Rule over you? I always felt like I was being a little dishonest in my days as a legalist when I spoke of the rules and regulations of the faith I belonged to, particularly in trying to explain them to new converts or questioning prospects. Our ladies weren’t allowed to cut their hair, color their hair, trim their hair, perm their hair, wear short sleeve shirts, tights/leggings, wear metal of any kind in their hair, or any form of jewelry/ornamentation, etc. To illustrate this, I want to start off with pics (pictures prove I haven’t altered the text in any way) from two exchanges I’ve had with people on YouTube content in the past week. In both cases, we are discussing the Oneness (Apostolic) Pentecostal Holiness movement, of which I was part of for 15 years, and their dogmas (standards) on dress. I won’t take the time to reiterate all of those things, but read these blog posts to learn more: Men and Womens Apparel in Ancient Days, The Commandments of Men, & Out of Context: Without Holiness No Man Shall See The Lord. In both cases, the individuals are defending their church dress standards, but claim things that aren’t true, and then do what I used to do, and that is to be dishonest about what the ‘standards’ really are. These are Oneness Pentecostals responding to my videos and other videos on the same topic – Dress Standards being Law. This highlights the disease of this belief set – because it gets rooted in their hear that if you don’t dress like them, you are a harlot. Then of course, when asked how they make the connection between ‘Be ye holy, for I am holy’, and ‘Without Holiness, no man shall see the Lord’ and their dress rules, He/She says what I used to say. “It’s not a dogma its preference you make it a heaven or hell issue out of it’. That my friend is a Law. This one became even more interesting and this is just a small portion of the whole conversation. What always intrigues me about these ‘defenders of the faith’ is how rude and arrogant they tend to get. This is just a sampling of the fervor you will find defending the dress standards of the Apostolic Pentecostal faith. So I did a little social sampling/research, asking questions like this one. “The Bible says not to take away from, or add to the Word. Jesus made it clear in Mark 7:7 that men who created their own laws (let’s call them standards) for the people, things outside of God’s word, were hypocrites and that worshiping Jesus in those things was vain and useless. Nowhere in Scripture does it say the Pastor has the right and duty to make up his own church rules, required for membership, that are outside of Scripture, and we aren’t talking about carpet color and instrument selection. What is the difference between a Standard and a Law? A law is something that is written into statutes that all people must obey. Disobedience to these laws results in penalization. 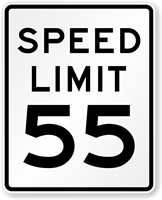 In this simple example, the white background speed limit sign is a posted law. If you exceed this limit, you can be subject to penalties including traffic violations and fines. Normally (In the U.S.) you’ll have to appear before a judge and defend or plead your case. You are sentenced from your infraction and you pay the fine or duty that the judge imposes on you. That is how Law works. The yellow background speed sign is a Standard. It is an Advisory Speed sign. You’ll normally see this when coming into a space of road that has a lot of curves or is windy. They will post a sign that is the suggested speed for which it is safest to drive that stretch of road. Exceeding this limit may place you in danger of not handling the road well, but it is not a traffic law violation to exceed this speed. If you are doing 35mph in a 25mph advisory zone, you have broken no laws and will not be judged for your behavior. This highlights the simplistic distinction between Law and Standard. You see, while we/they can claim that the Standards of the Apostolic Holiness movement are not Laws, they (and I was this way) are being very dishonest. I know people who defend these standards in this fashion who are not intentionally being dishonest, in fact, most aren’t, they are just regurgitating what they are being fed from the pulpit. People will say, ‘Our dress standards are not laws’, and yet, they will in the pulpit (and I’ve heard it hundreds of times) say, “No woman wearing pants and lipstick is going to make it to heaven.” In the first conversation image I posted, these people always backlash when you question their standards, by saying things like, “Fine, go find your self a church where you can be a harlot (wear makeup)”. If something you do keeps you out of heaven, it is because you have violated God’s law. So if the claim is, ‘You can’t go to heaven if you aren’t obeying the standards’, then you know assuredly, that those are Laws, not Standards. This is a Standard. This is something based in principle, that you are not judged for, that you are not legislated by, and your membership to the church does not depend on. Would following the example set before you be extremely wise? Absolutely! but it is not a Law. God alone, if you believe in God and in His Word, is the only one capable of creating Laws. Those Laws were written. The faith was once (and for all) delivered unto the saints. What is going to keep you out of the Kingdom of God was clearly written in Scripture. To add to that is such a dangerous thing. Let me end by saying this: If you, for yourself, believe that wearing a certain piece of clothing, or worshipping at a certain time helps keep you closer to God, than by all means, do it! I am not judging you, or anyone for the personal standards and convictions they want to keep. Paul made it clear that you are blessed (happy) for those things you allow. Your own personal convictions. What I am coming against, is entire organizations making ‘standards’ that keep people in or out of the church, and to their set of beliefs, also keep people in or out of heaven. If it wasn’t written in Scripture, and it’s taught as something you must do, it is a man-made law and should be called for what it is, an error and fallacy. My heart is almost literally bleeding for you right now. I know and empathize with exactly where you are. I was not 4th gen, I was first gen, but I married a 2nd gen UPC member who has stayed in the church and is more loyal to them and the pastor than to me. I did not leave my Faith in Jesus, I left the disease of legalism. But to them, I’m reprobate. And, like you, I want to put my kids in normal clothes and let them play as normal children, but it turns in to a fight and is a very difficult thing to deal with. When leaving, I had no one to turn to, not a single person I could talk with, to get help, advice, my entire social strata had been contained in the church. I was literally in the spiral you are talking about, and it took me a long time to figure out again who I was. It even took me months to totally break free from the legalism and become comfortable wearing a short sleeve shirt because our church caused us to believe short sleeve shirts were unholy and sinful. Then, I discovered a few things that turned it all around for me. The first was getting the book The Subtle Power of Spiritual Abuse, and the book Toxic Faith. I would be happy to send you copies of those books, and you can also request free copies from a website I am associated with, http://www.spiritualabuse.org. Some of my work is sponsored on that page. The second big help to me was THAT website. There are hundreds of people just like you and me sharing their stories. There are blogs, videos, links, resources, etc. The powerful aspect is to realize YOU are NOT Alone. You feel alone right now, physically, but what you are going through, and the trauma of being in legalism/cult, and the fear of leaving is real, and scary, and painful. Finding others who did it to gives you a coat tail to hold on to. Then, I found several online communities to connect with, and they are secret groups so that you can share your story and find support without being afraid of people in your church world finding it and condemning you. I will gladly connect you to those resources. Please find me on Facebook – My name is Ralph Brickley. I can connect you to two or three really awesome groups. In the last two weeks I’ve helped half a dozen people join those groups, some of which had been in UPC 30+ years and the healing they receive by having those connections with people is life-changing.